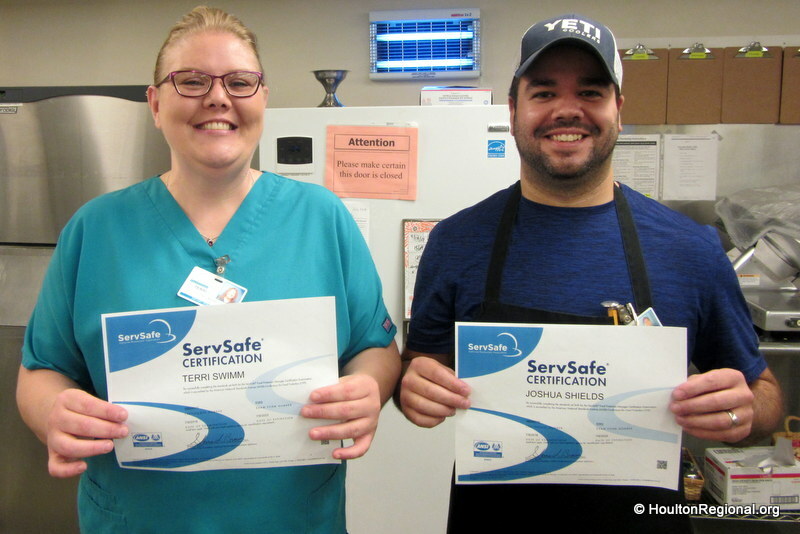 Congratulations to Terri Swimm and Josh Shields of the HRH Dietary Department for becoming ServSafe certified. ServSafe is a food and beverage safety training and certificate program administered by the National Restaurant Association. The program is accredited by ANSI and the Conference for Food Protection. Terri joined Houlton Regional Hospital in 1992 starting in Housekeeping and then joined the Dietary Department in 1994. She has been cross-trained for all job duties and is looking forward to furthering her career. Terri resides in Houlton and enjoys her son Brandon, family and friends. Josh Shields joined Houlton Regional Hospital in 2013 as a cook. He has been cross-trained for most of the job duties in the dietary department. Josh is always a willing team member and we look forward to his future accomplishments. Josh resides in Linneus and enjoys his son Dayton, family and friends, and his dog Opie.